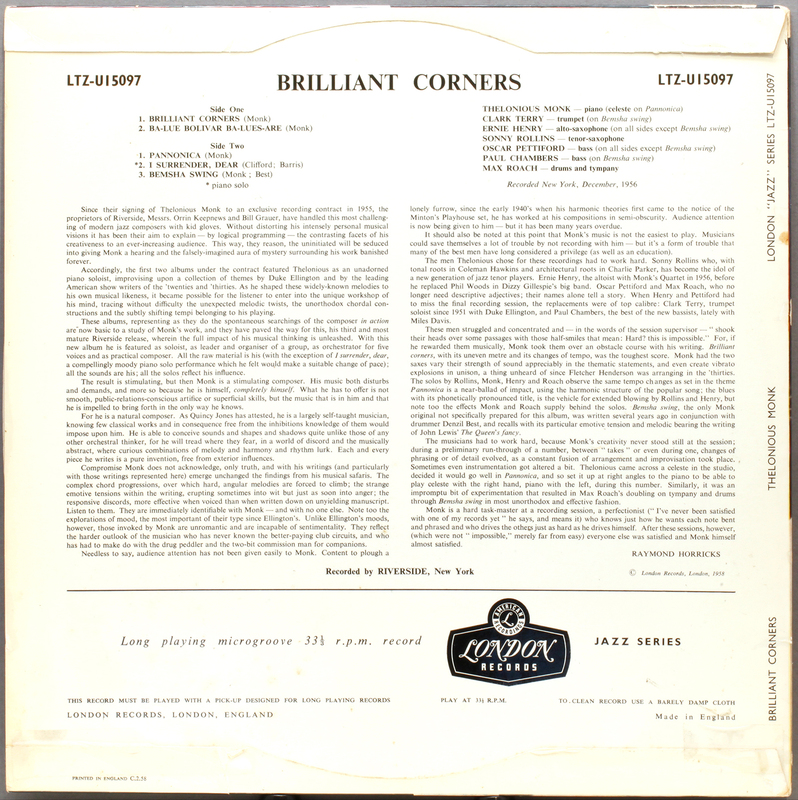 Brilliant Corners, recorded for the Riverside label in 1956 with an A-list band including saxophonist Sonny Rollins and former Charlie Parker drummer Max Roach, was the most compositionally ambitious session in the former church pianist’s decade-long jazz career thus far. In a legendarily fractious session, the title track’s growling theme was so treacherous in its lurching phrasing and abrupt time changes that a band this good still spent 25 takes on it, and the final version was only possible by splicing two takes together. But Brilliant Corners was no calculated technical highwire act, but a piece of audaciously adventurous composing that has never lost its power to startle and seduce over the decades. 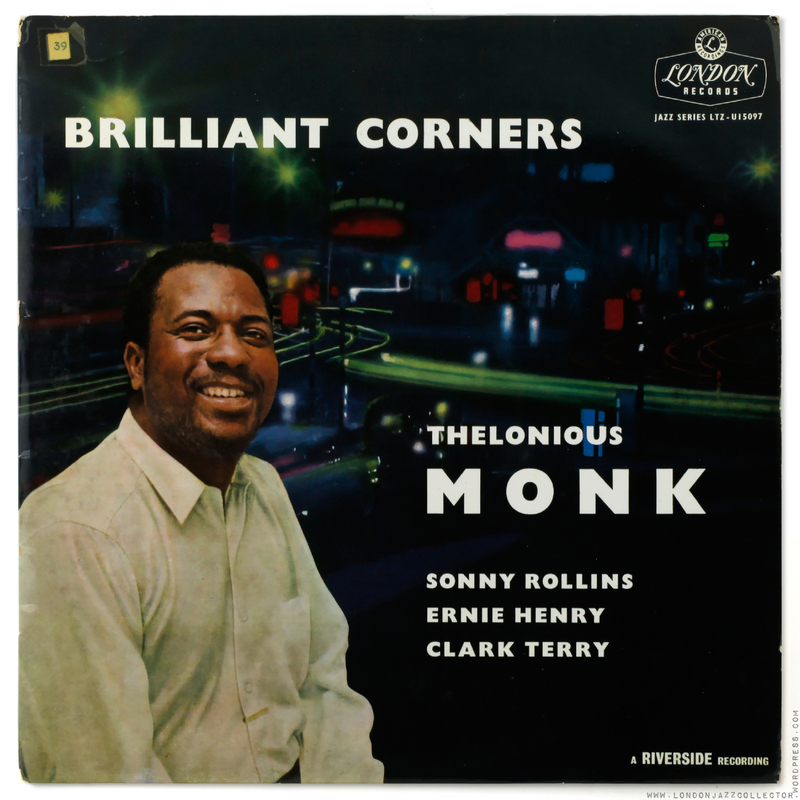 From Monk’s opening stabbed chords (as if he were chipping rock) to the bone-shaking notes, guttural horn harmonies and sudden thematic gallops, Brilliant Corners is gripping – as are the composer’s jangling improvisations, and Rollins’s lazily unfolding and huge-toned tenor solo. The session’s full of captivating variety too – from the urban graininess of Hornin’ In to the relaxed groove of Let’s Cool One, the surreal mix of Monk’s chordal bluntness and the coyness of a glockenspiel on Pannonica to the bleary rootsiness of the wonderful blues Ba Lue Bolivar Ba Lues Are. Arriving just before the late-50s free-jazz upheavals of Ornette Coleman, John Coltrane and Cecil Taylor, this was music that showed just how powerfully song-form harmonies and the tempered scale could be wrenched into new shapes. Not on my system, long way short. 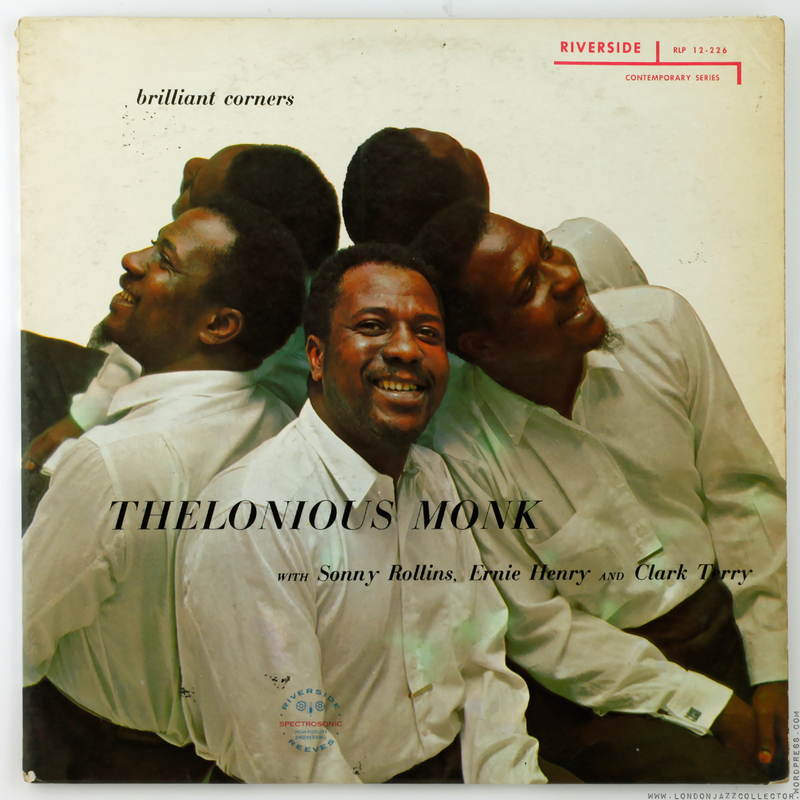 The Decca flows effortlessly, is more musical, more pleasurable to follow Monk’s jack-rabbit assault on the keyboard, sit back and hear Rollins and Henry struggling on their 25th take of Monk’s fiendish composition. The Riverside is limp, trailing, dragging, entirely lacking in the fierce malevolent alto/tenor brass of Henry and Rollins. The London/ Decca press takes this brilliant corner to a higher plane. Only my opinion of course. You may disagree. First blogged the Riverside edition of Brilliant Corners nearly exactly two years ago, April 19, 2012. My, doesn’t time fly when you’re having fun. This UK edition turned up and I couldn’t resist the opportunity to put my “original is best” maxim to the test. As usual, a surprise was just around the corner. 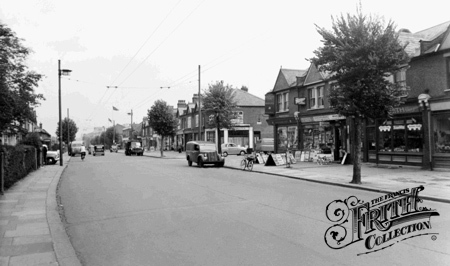 Located in the south London suburb of New Malden, Decca’s first class engineering skills were honed on the recording and pressing of classical music, strengthened by the consumption of many cups of strong tea throughout the day, and the occasional sticky bun from the factory trolley. 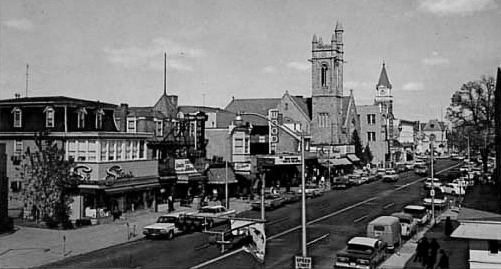 I imagine 1950’s suburban New Jersey to be an only slightly more exciting. No reason why Riverside engineering supported by many cups of strong coffee and the occasional Danish shouldn’t translate into a superior original pressing. But the theory is often confounded by the annoying contrary nature of the facts. Progress! It’s about two years since I asked WordPress to fix its embedded music player but they have finally done it.. It is now a natty column-width player, in black, which displays the track length, progress bar, and elapsed /remaining time and volume control. That’s nice. This is a reminder to me to do more homework on the Riverside label. The wheels are coming off my trolley fast. Postscript 2: Two different addresses on the liner notes, with earlier and later titles promoted. 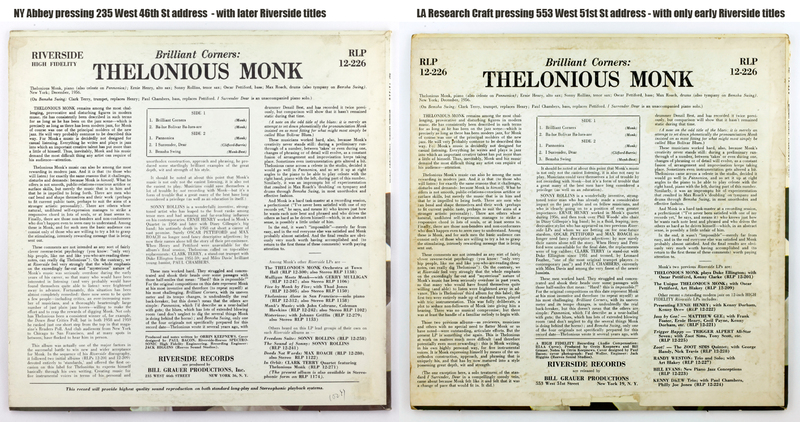 The West Coast pressing (right) has an earlier set of liner notes with the 553 West address which refers to other early catalogue number Riverside releases existing at the time. The NY Abbey pressing cover has a 235 West address and a later set of liner notes which refer to later Riverside titles. This entry was posted in London, Riverside, Thelonius Monk and tagged Decca New Malden, Ernie Henry, Max Roach, Oscar Pettiford, Sonny Rollins, Thelonious Monk by LondonJazzCollector. Bookmark the permalink. On 1st February 2015 the London Classic Album Sundays monthly event featured Brilliant Corners. The first two tracks were from the out of print limited edition Analogue Productions 45 RPM cut of Brilliant Corners, with side two played from a UK white label copy believed by the owner, from hi-end Gearbox Records, to be UK Pye (which gets a cautionary remark from LJC elsewhere) but by the sounds of this post was possibly Decca. I say a little more re this at downwithit.info but, to my ears, the AP version was superb with lots of what we could call space, while the White label lacked bass and seemed compressed. The horns and bass on the AP were totally engaging, while the crucial kettle drums on the Pye (?) cut of Bemsha Swing were a massive disappointment and the overall impression of Side 2 was that it was strident and tinny. The audio equipment used for the session included a Rega P9 with high-end Dynavector Cartridge, an Audio Note Jinro Amp,a pair of Klipschorns and bass units and audiophille cabling and power supply that you can read about at the CAS website. A wonderful hi-fi but space considerations mean that until I swap my parlour for a ballroom I won’t be trading my Rega /Naim/Spendor kit (which sounds great) for the Klipschorns. I’m tempted by the AP cut of Brilliant Corners though. Interesting DWI, I saw an email on the Brilliant Corners event, was tempted but my sofa and vintage pressings were too comfy to venture out. The provenance is interesting. 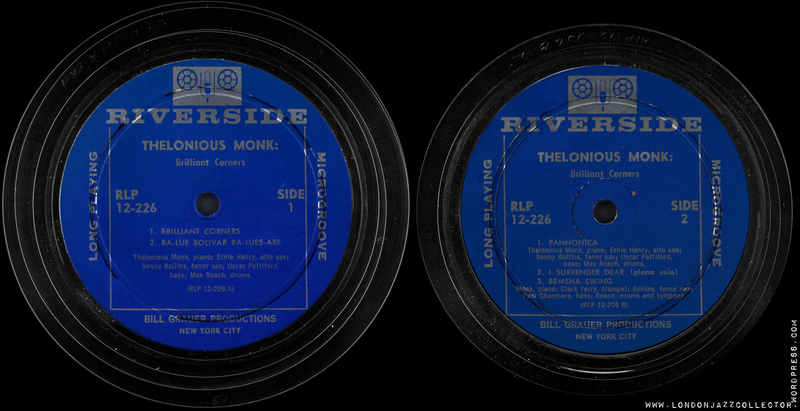 Not sure why Pye/Nixa would be involved with what is a Riverside recording. Decca’s London label held licensing for Riverside, LTZ-U ##### moniker, and certainly Decca test pressings, of which I have four, are quite stylized with gear-teeth markings around the rim of the label. Did this look like it? Maybe someone was confused, or may be I am. Decca test pressings don’t actually say “Decca” on the label, but they have Decca’s characteristic matrix stamp, for one who knows. 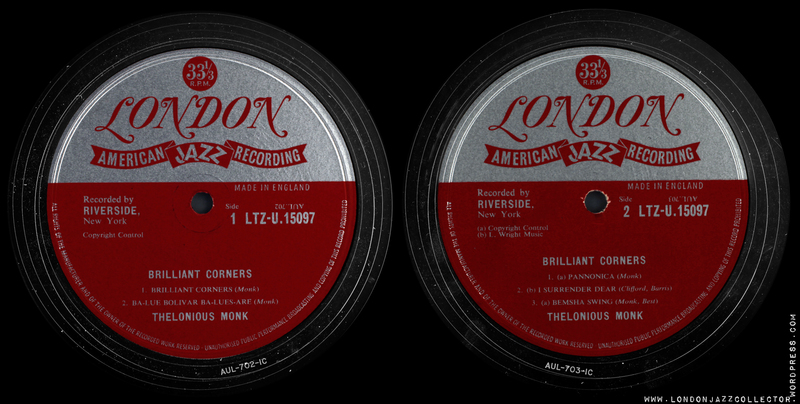 I have noticed big swings in audio quality between my different pressings of Brilliant Corners. (Riverside US and London/Decca ) Perhaps it is a recording that in its original state “needs tweaking” to bring it out, which might explain APs superior performance in this test. Maybe they tweaked it better. As I say, interesting. I have just the one AP 45 of a Blue Note and I don’t rate it very highly compared with the original Blue Note. Perhaps these things vary from one record to another. Can only be good to get more tent pegs in the ground. I didn’t get a look close up- but there are currently pictures of both sides of the label on the CAS Facebook page (no detail of run out grooves though) and just a generic stamp with no info and possibly recent handwriting with a mis-spelling of Thelonius (sic). Nothing like your Decca test pressing pic. If I remember correctly, the copy was received by the Gearbox Records guy from Don Rendell, which adds provenance. I can’t help but feel that Roach’s timpani would have sounded great from the AP version. The pressing ring in the center of the label on that test pressing sure looked like Pye to me! Pye were half owned by a commercial television company ATV, and their cultural contribution to British music was the budget Pye Golden Guinea range (£1 and a shilling). I’m pretty sure I had Huckleberry Hound and Yogi Bear albums on this label. “Brilliant Corners” doesn’t naturally fit the profile, but I could be wrong. Wouldn’t be the first time. Not really anything to do with any of the presses of this album, but I thought you might be interested in the ‘Thelonious Monk Complete At The It Club’ 4 LP live set from Mosaic, still apparently available at 100US. Sound quality knocks the Columbia/Sony Legacy CD edition for six! Beautiful sound, fantastic music. A must-have…. Thanks for the tip-off. Yes, I already bought it, some months ago. All I need now is some free time to listen to it! I like the first and the last song of that album, the three songs in the middle failed to get me. I have this on an original Riverside pressing and have always thought it sounded fantastic. If I’m not mistaken the recording above is a second pressing correct? shouldn’t the first feature a white label? Either way my copy has always sounded amazing to my ears, and is one I’ve always felt was a gem so I’m suprised ath these results! It’s actually a third pressing, the first was on the white label (like yours), the second on the large blue label with no “INC.” and the third was on the small blue label like the one pictured. That may explain a few things here, thanks. You have to know which generation US Riverside press is in front of you. What is the matrix details for your US copy? address on cover: 553 West 51st Street New York 19, N.Y.
See Postscript 2 – the US covers. Two different addresses for Riverside from different dates, the West Coast Research Craft pressing with the 553 West address seems to be the earlier. Pictures up in postscript to the post of my other , West Coast press. If anyone can make sense of this, its not me. Yeah, the Decca sounds like it has a veil lifted from the music. Anyone else notice the weird warble just as the horns come in on the London/Decca copy? Very true, Aaron! Seems like the tape machine / cutting machine was having some wow & flutter problem. it seems that decca wins to my ear, too. notably, my ear for such things is not as sharp as most people. i find my brain tends to focus on the execution and think about how the musicians are doing what they’re doing, and i don’t focus on hearing the actual music as much sometimes. weird, but true. even i hear the decca as superior here, though. and i’m even a devoted follower of the church of the first pressing. for shame. yep. sounds like the london/decca takes the cake! brighter, more attack and feels more ‘present’ overall. nice review. It’s got more “attack” because it is louder, in the first place. Maybe I can construct an ideal situation by finding a Decca pressing and housing it in my Riverside jacket. I should be able to live with that, right? There’s no reason to think that act would gnaw at my conscience, day and night, pepetually, until corrected late one groggy, feverish night. I mean, they’re just records, right? I feel challenged every time somebody finds one particular pressing “dragging” or lacking in “pace”, and it has on occasion turned out to be a speed issue, caused by some long-abandoned Numark turntable. 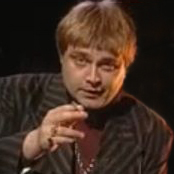 The Riverside is, indeed, slower by 0.7 per cent – put the blame on the vinyl, not the turntable. But no one would be able to hear that at once – at least I can’t. The other thing is that you “pushed up gain by 20% to compensate for a very quiet recording” – and it still is about 4 dB below the Decca! From what I can see, the two pressings differ both in level and in dynamics. The wave diagram of the Decca looks “better”, and it also sounds better. Excellent bank holiday choice, if I may say so, but no links included in the email!